Over the weekend I was thinking it has been awhile since I made a dessert. So I thought I would come up with something that would last for a few days and could serve as a mid-week treat. I got this idea from thinking I should eat more “raw”. And although I could never cross over to the Vegan side, I do love how the focus is on natural, unprocessed foods. A lot of vegans use raw cashews in many of their dishes and it really inspired me to try it. Fortunately it worked out well so don’t be surprised to see a few more paleo recipes on here that use cashews because I’m now secretly, nay, openly obsessed with the powers of cashews! Ok, ok – so it’s not really cheese and it’s not really cake per se. But in the spirit of politics, the art is in the deception right?? RIGHT. I think non-paleo diners will eat this and be happy too; I’m all for bipartisan recipes! 1) In a medium sized bowl, soak your cashews in water and cover the bowl. Leave in the fridge overnight. 2) In a small blender, take your dates (without seeds), walnuts and almonds and blend until desired texture. Add pinches of sea salt (to taste). Some people like their crusts with thicker pieces of nuts while others like it super blended. I chose to go somewhere in the middle so you can taste the bits of crunch. 5) While cashews are blending, simply put blueberries in small sauce pan with 1/2 a cup of water and crush some of the blueberries in the pan with your stirrer. This will help make the topping more “blue” and mix with the water. I didn’t add anything else and just used plain blueberries and felt the sauce was quite flavorful! Next time I might try some lemon juice or vanilla or chocolate. 6) Once the cashew cream is done blending, just pour it in the pie pan and leave in the fridge for an hour to chill. 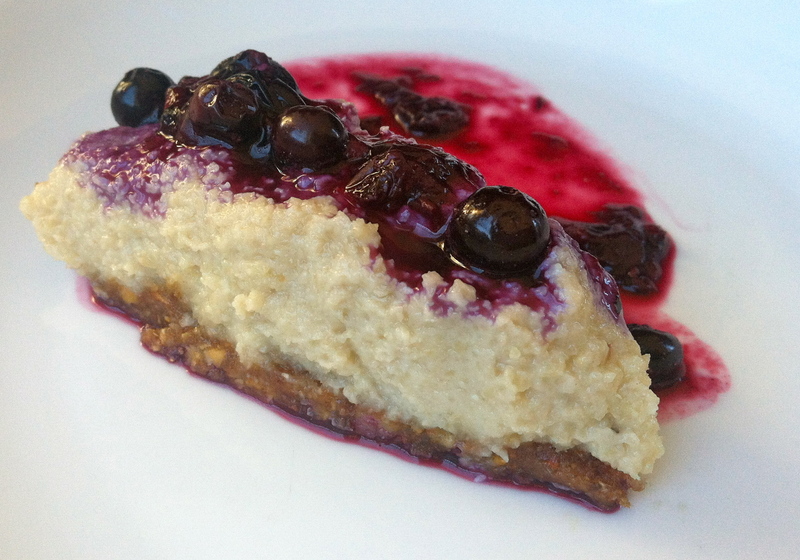 7) When you’re ready to eat, take out of the fridge, pour blueberry topping and voila! 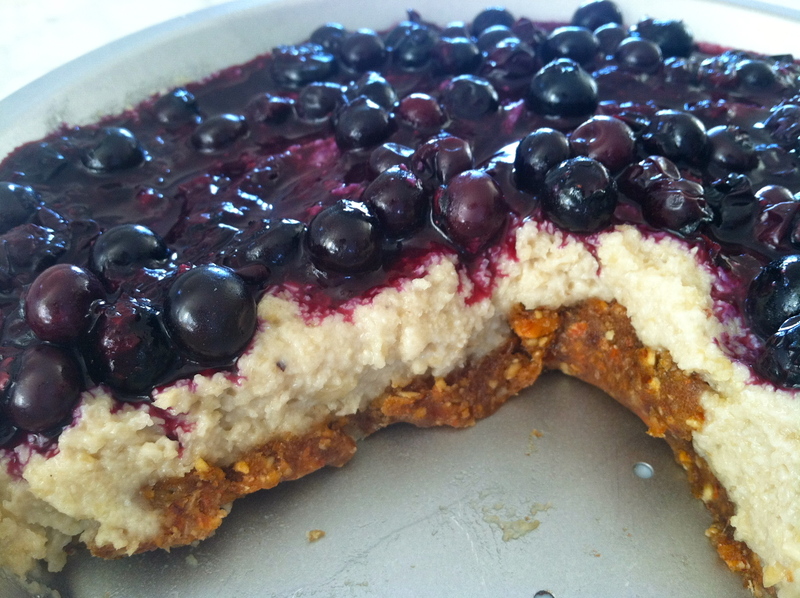 Paleo Pie!